The conversion of the Masrah Al Qasba Theater in Sharjah is the first project to be completed by magma architecture in the United Arab Emirates. 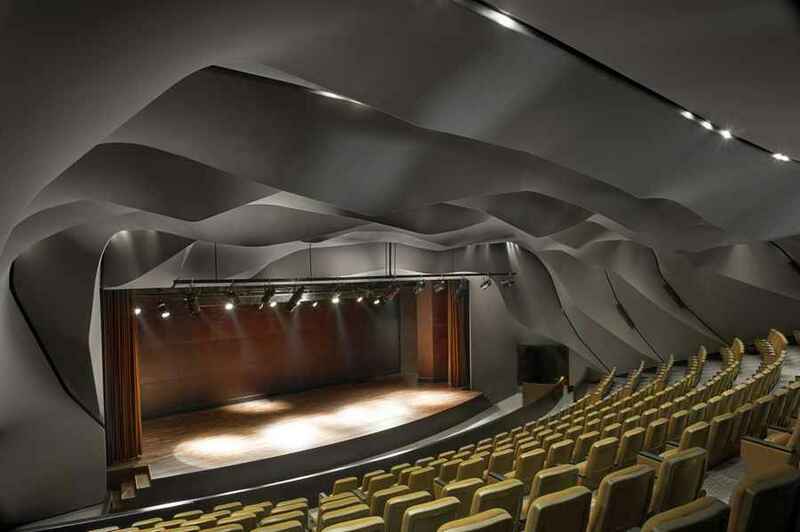 Visitors to the 300 seat auditorium find themselves wrapped in a sculpturally undulating space evoking recollections of the landscapes of Sharjah. Carefully concealed lighting elements shining through stretchable fabric surfaces enhance the spatial sensation of continuous enclosure. The Masrah Al Qasba Theater is shortlisted for the 2012 LEAF Awards. The client brief was to create a theatre design equally rooted in the nature and history of the Emirate of Sharjah as embracing its cultural future. The design for the new Al Qasba conversion is based on a subtle atmospheric amalgamation of everyday life of the past and contemporary world of theatre. In the days of nomadic life news was transmitted through oral narrative in the open-air of the nocturnal desert landscape. The design of the Al Qasba auditorium refers to the nature of Sharjah as inspiration and suggests an inverted, fully enclosing scenographic landscape. Undulating surfaces with light strips on fold lines scatter across the ceiling evoking images of evening sun streaking sand dunes. Visitors entering the auditorium disconnect from everyday life to immerse into the surprising and striking space of the staged narrative in the new Masrah Al Qasba Theater. Past and present are also mirrored in the choice of materials for the project. The interior skin is created out of textile, a traditional building material in the region, albeit in a high tech contemporary make. The textile wraps the walls and ceiling of the 300 seat auditorium space in a continuous smooth surface. Lights on fold lines gently accentuate the double curvature shapes. The design enables illuminating the space without blinding the visitors with lights. Placed on the inclined ceiling surfaces facing the stage the auditorium lights remain invisible from the spectator seats. Additional spotlights installed in the cracks in the surface can be switched off to create a softly dimmed illumination for lectures and talks. magma architecture also designed and refitted the theatre lobby and adjoining rooms. A completely white space with soft light in changing colors invites visitors to meet and linger and enhances anticipation of the theatre visit. The Al Qasba is the main entertainment, cultural and tourist destination of the Emirate of Sharjah. Two 150m long and four stories high buildings face each other on the banks of the Al Qasba Canal. They house art galleries, shops, restaurants, business centres, meeting halls and offices flanked by the Etisalat Ferris wheel to the North. The Masrah Al Qasba Theater is the venue of cultural and entertainment events like the annual Sharjah film festival. magma architecture was commissioned with the design in 2008 by the Al Qasba Development Authority. Construction started in Sharjah in 2011 and was completed in 2012. A technically simple solution was developed to create the double curvature surfaces of the auditorium. Ceiling and walls of the auditorium are covered with a polyamide and spandex textile stretched over an aluminium substructure. Telescopic rods push out the expandable fabric to form the hills and valleys of the enclosure. The angle of the aluminium bends were defined using a computerized bending machine. The fire rated fabric is fixed with Keeder clips into a framework of aluminium profiles. Technical installations such as air conditioning, sound equipment, light fittings, electrical wiring and acoustic insulation are concealed behind the porous fabric surface. Maintenance spot lights and ventilation outlets and intakes are recessed in ceiling joints. magma architecture – founded in 2003 by Martin Ostermann and Lena Kleinheinz – is an award-winning, multidisciplinary practice operating at the interface between architecture, design and communication. The studio specializes in creating visionary landmark buildings, spectacular temporary structures and expressive interiors. The largest commission of the office to date is the iconic shooting arena for the London 2012 Olympic and Paralympic Games.